First impressions are everything, and Agency Pro’s smart look and ease-of-use will take your client and customer connections to the next level. The Agency Pro Theme examples featured below demonstrate the flexibility of the Agency Pro theme. These examples show how this theme can present professional services with confidence and clarity, but can easily be repurposed to serve as a memorial website. These projects were completed by our Web Design Firm, SangFroid Web. Memorial Website for Walter H. Eisworth, M.D. completed in 2015. The featured home page section is used to display featured blog posts from the memorial blog. We use the Agency Pro Theme on this very website! The home page featured section is perfect for featuring specific StudioPress themes. WPStudioWorks Website featuring portfolio items. The Agency Pro Theme by StudioPress features a large backstretch background image on the home page that gives it a lot of impact. The featured area on the home page uses Featured Images prominently and so is ideal for featuring Portfolio items. 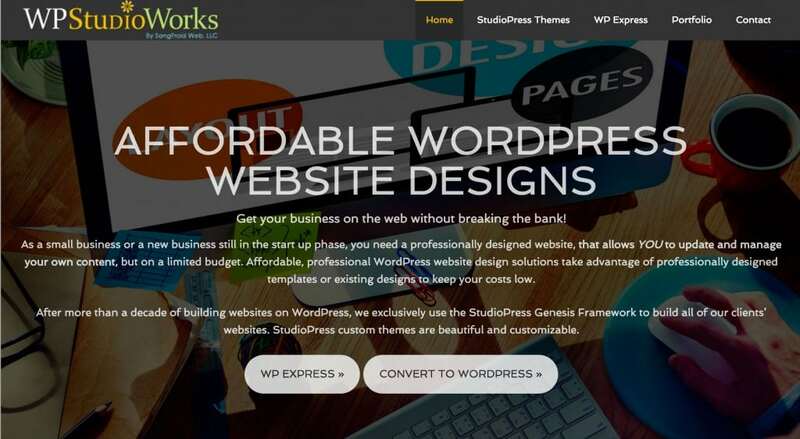 WPStudioWorks showcases websites built using StudioPress themes and the Genesis Platform for clients by SangFroid Web, LLC . We have been providing professional, integrated web design solutions for business owners and solo professionals since 2007. Many links on this site are affiliate links, but we never recommend a product we don’t use and love ourselves. 2017 StudioPress Black Friday Special – 25% Off!